What’s green, circular, covered in bees and “pings” if you flick it? A dustbin lid meadow of course! Wildflower Meadows are some of the best wildlife habitats we have , supporting countless bees, butterflies and many other insects, (not to mention mammals, reptiles and birds ) yet its estimated that we have lost over 95% of our wildflower rich meadows during the past 60 years or so. We rightly criticize the loss of ancient rainforests in far flung corners of the world yet we’ve somehow allowed our own vast “reservoirs of biodiversity” to be virtually ploughed and poisoned out of existence by modern farming practices. Fortunately, the last remaining remnants of our ancient meadows are now mostly protected and, in some instances, being extended, whilst new meadows are being created elsewhere. In our suburbs and towns, many ecologically aware gardeners have dug up their sterile , old lawns in order to create small meadows of their own. Others are simply allowing their existing lawns to grow a little longer and so enable the wildflowers( already in them) to rise up and blossom. 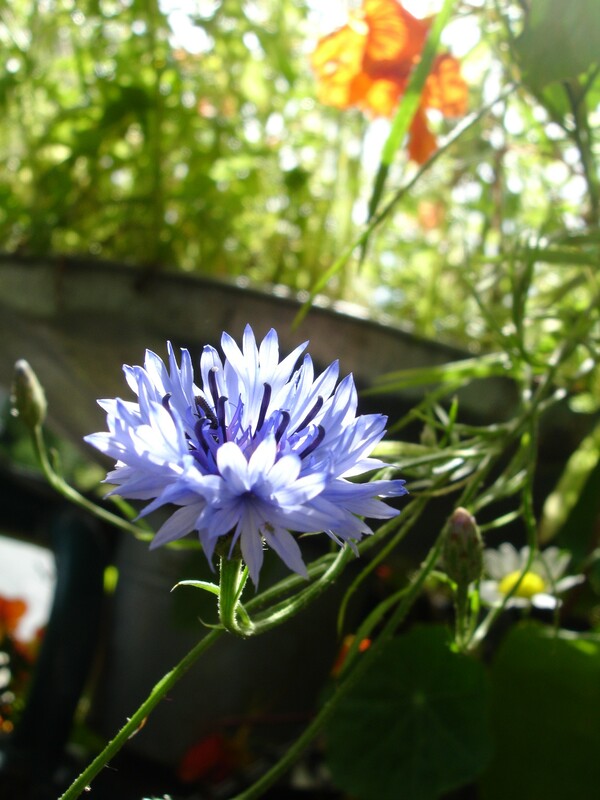 Whilst it wasn’t possible to reproduce large swathes of species rich grassland on my tiny little balcony (I wish! ), I was certainly intrigued with the idea of creating a mixture of grass and nectar rich wildflowers which, at the very least, tried to capture something of the meadow’s colourful aesthetic as well as its ability to feed a range of invertebrates. So, inspired by a redundant dustbin lid, ( leftover from a galvanised dustbin which I’d just converted into a planter), I set about creating a mini-meadow on my balcony. Turning the lid upside down, I simply drilled a few small holes in to its centre, for drainage, which I then covered with a few bits of broken crockery to help prevent soil blocking up the newly drilled holes. I then sat the lid (still upside down of course) on top of a small galvanised metal plant-pot which I then sat on the balcony’s rail. Using strong galvanised wire, (obtainable from most garden centres and DIY shops), I secured it to my balcony’s outer rail. I then simply filled the lid with “peat free compost ” into which I’d mixed in some water retention granules (obtainable from most garden centres). Whilst I would usually add an organic fertiliser to my compost, in this instance I didn’t as meadows actually thrive on soil which has very poor fertility as this helps to prevent the grasses from out competing and smothering the wildflowers. Once the compost was in place I sowed a mixture of colourful cornfield annual seeds (for first year colour) as well as some traditional perennial wildflower seeds which I hoped would establish themselves in the longer term. I was very surprised and delighted with the results! 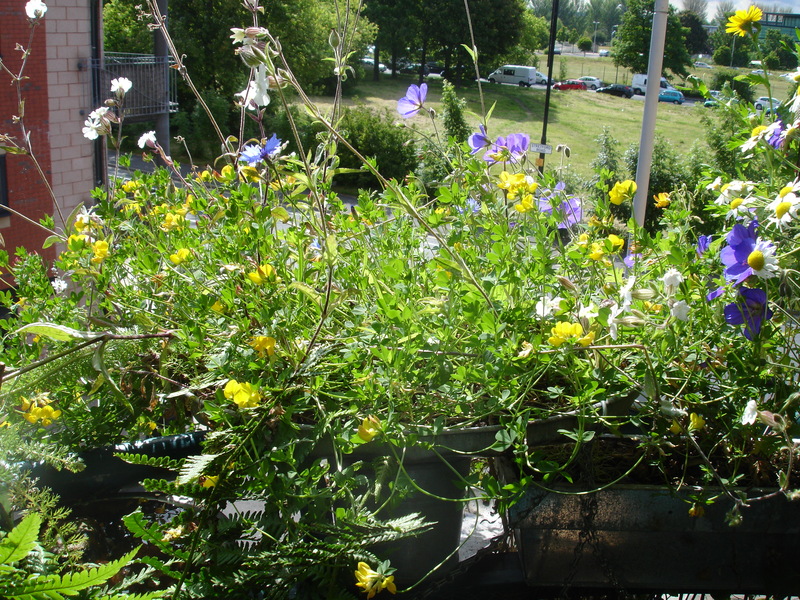 Wildflower Meadow – in a dustbin lid! During the first summer after sowing , the cornfield annuals made a colourful instant splash and were a magnet for bees and hoverflies. The lovely blue annual cornflower can be seen in the foreground with a vibrant red poppy in the background. These annuals would eventually be succeeded by the perennial meadow flowers which I’d also sowed at the same time. As anticipated, the cornfield annuals made a really colourful splash within a few months of being sown in to the dustbin lid. Blue cornflowers, crimson poppies ,yellow/white chamomiles, corn marigolds and lanky, purple corncockles all vied for the attention of foraging bees, hoverflies and beetles. These colourful annual wildflowers were once very common in our countryside, thanks to the age-old practice of ploughing cornfields annually, but are now very scarce due to modern farming practices which includes the liberal use of weedkillers. 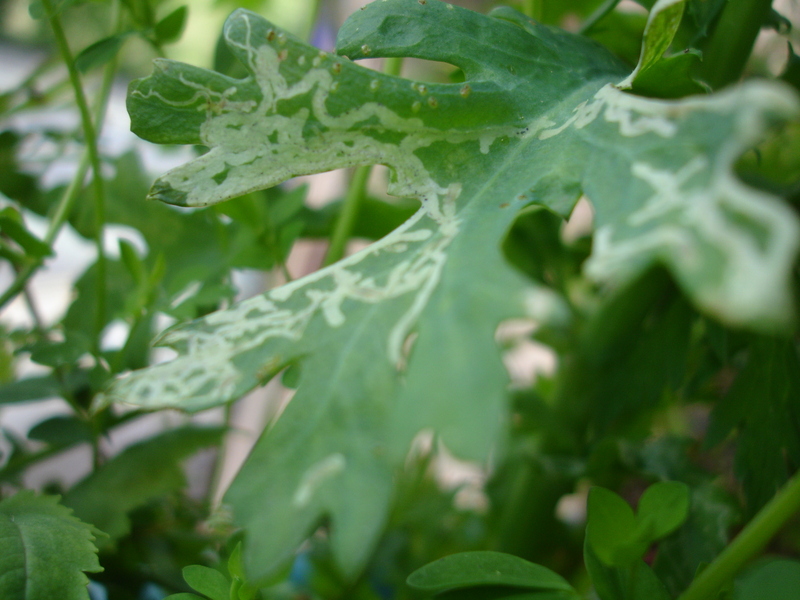 Even the leaves of the meadow’s corn marigolds provided food and shelter for microscopic “leaf miners” who’s tiny size allowed them to burrow in between the leave’s inner tissues – as can be seen here by their pale “track marks”. Once the cornfield annuals had finished flowering and had started to die down, it was possible to see the emerging perennial wildflowers which I’d also sown at the same time. These included birds-foot-trefoil(a magnet for bees) as well as white and red campion and self-heal which all helped the meadow to buzz with bees and helped to attract many other insects, too. 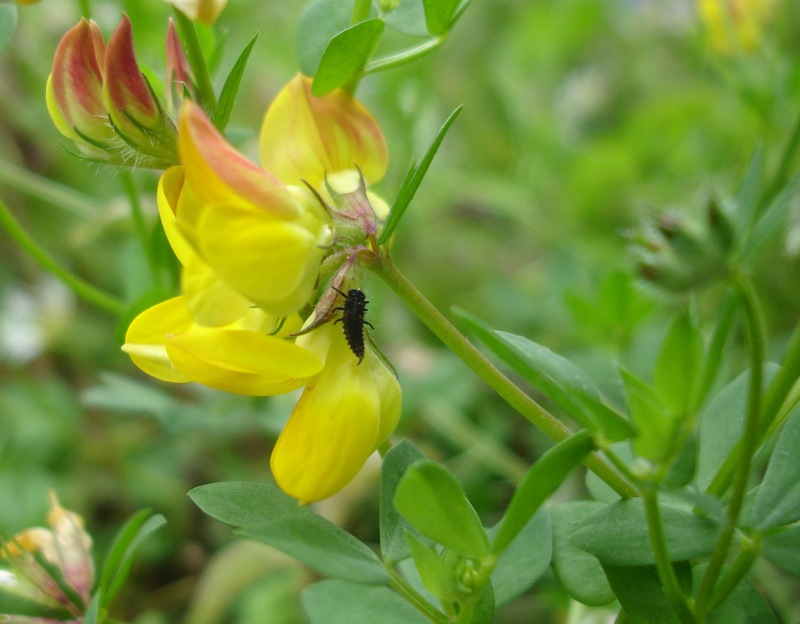 Aphids certainly seemed to enjoy the meadow flowers’ sappy stems who’s subsequent population boom attracted predators in the form of ladybirds and hoverflies who’s larvae then preyed on the aphids. Although the dustbin lid meadow was created over 2 years ago, it’s still fascinating to see how it continues to develop and evolve over the seasons. As expected, the cornfield annuals eventually stopped flowering as they need continually disturbed soil in order for their seeds to germinate. The perennial wildflowers, however, continued to thrive with birds-foot-trefoil becoming the dominant species but with other species, like ribwort plantain , beginning to emerge and flower within the meadow, too. Of course, as the dustbin lid meadow continues to develop and evolve I’ll be certain to blog about its ongoing progress and the amazing range of wildlife it continues to attract and support. Thanks. I notice that you make and supply balconies. 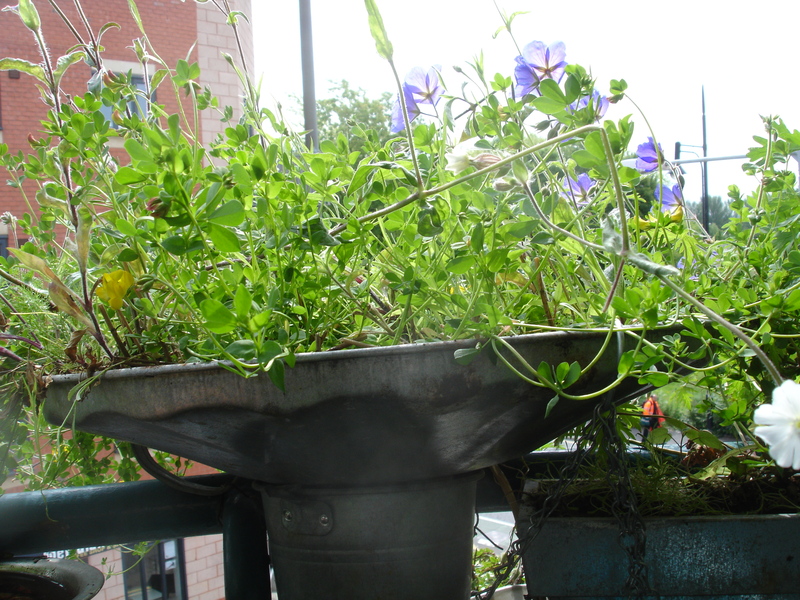 Ever thought of incorporating planting troughs into the balconies you make? That would give you an edge over other balcony manufacturers and encourage people to grow plants on their balconies? Great stuff. It’s given me some inspiration for planting in my backyard so I’ve been out today and bought a variety of plants. 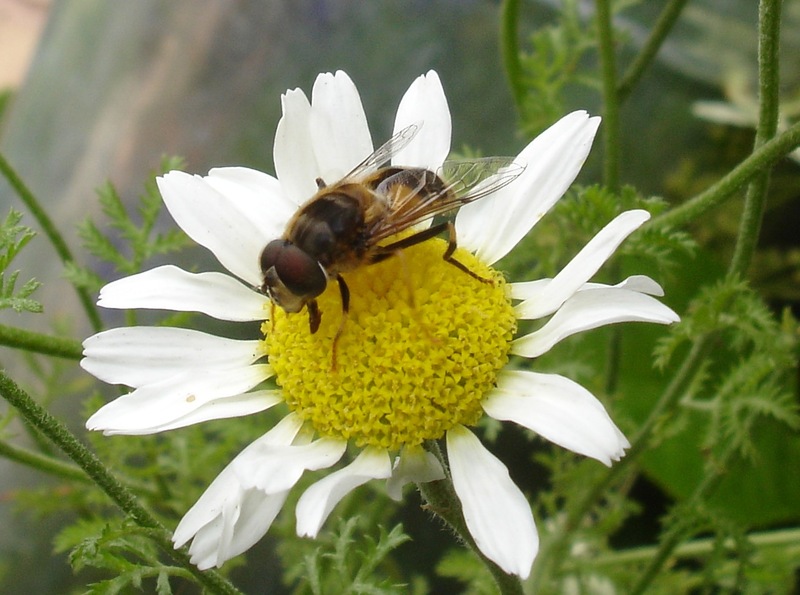 I took them outside to plant and within a minute there were a couple of bees (or maybe bee-looking hoverflies!!) on the nepeta mussinii. I really want to encourage birds as well but have two cats so I think I’ll have to give that a miss. Hi Paurina, there’s no need to feed me but happy to come over and look at your garden and then maybe head over to hulme garden centre to help you choose wildlife friendly plants….if that suits you? Can’t do this weekend but maybe next friday or saturday afternoon?